Kristin is a motivational source of wisdom and inspiration. When we first came across her beautiful watercolor quotes paired with captions to speak directly to our souls on Instagram, we were hooked. Then we learned her story and were even more in love. Not too long ago, Kristin left her Corporate America job as a workplace consultant to follow her heart in becoming a life coach. Taking the raw messy unfiltered vulnerability which is life and coaching her clients to identify their strengths while uncovering self-limiting beliefs and hidden thought patterns — she's changing the world and reminding us all of the truth of who we are. We love Kristin's brand message: we're all sacred souls living a messy, beautiful, human experience and we're in this game of life together. We also love the way she delivers her message: whether we are scrolling her gorgeous Instagram feed, tuning into her Soul Sparks Podcast, where she interviews other like-minded, motivating individuals, or opening up our emails to find a Soul Sparks Newsletter in our inbox (sign-up here). 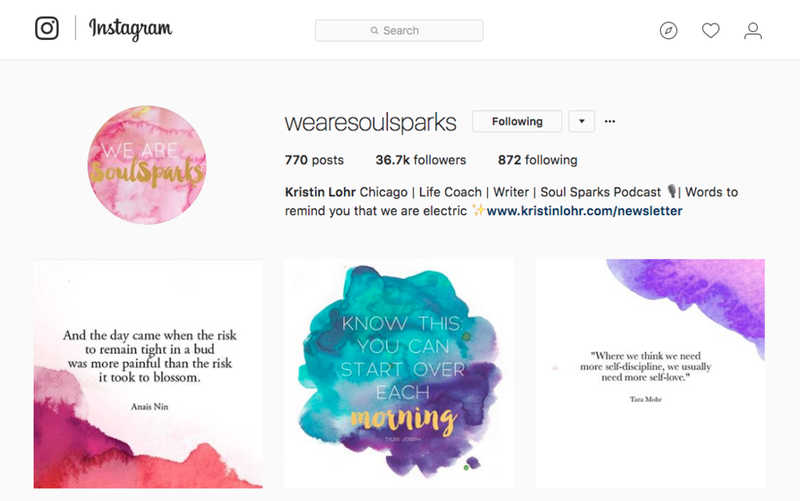 We're here to celebrate all the inspiration and motivation Kristin brings to her clients and Soul Sparks Community she has cultivated. You can find out more about Kristin here, here & here. Leave us a comment below, if you find Kristin as inspirational as we do!